The Mr. Coffee Café Barista lets you be your own Barista right at home. With the touch of a button, you can choose between single or double servings of espresso, latte, or cappuccino. Featuring 15 bars of pressure to create delicious beverages you would expect from your local coffee house. 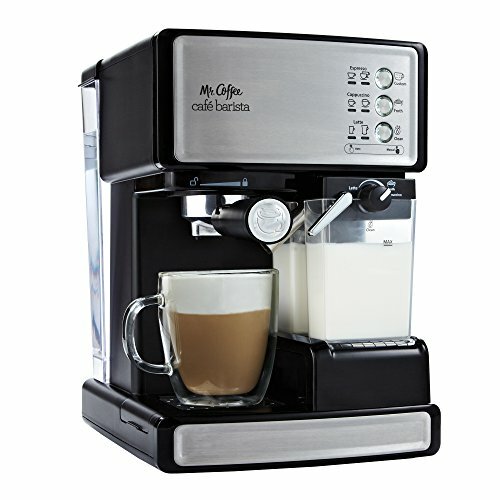 The integrated milk container allows you to easily create frothy lattes and cappuccinos without the hassle. Simply add your favorite espresso or coffee grounds to the portafilter, fill the milk reservoir and press one of the three beverage preprogrammed beverage options. The Mr. Coffee Café Barista will do the rest, creating a masterpiece before your eyes. The process is easy and creates great results With the manual espresso and milk froth modes, you can customize your drink exactly how you like it. The milk reservoir can be easily removed for storing in the refrigerator or easy cleaning in the dishwasher. The removable water reservoir holds up to 55 ounces of water so you can brew multiple drinks before refilling. The sliding cup height platform is perfect for brewing into smaller cups. The drip tray can be easily removed for cleaning. The included recipe book features 10 delicious drink recipes you can easily make with your new Mr. Coffee Café Barista.